House Bill 501 aims to change Vet Tech to Vet Nurse. 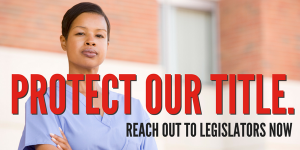 Tell legislators this is unacceptable – we must protect our title. ONA argued that the term nurse is legally defined as caring for humans, and that no other person or profession may insinuate they practice as a nurse. Our testimony yesterday delayed the committee vote, which means we need to act now. The chair and committee need educated on why we cannot allow other professions to adopt “nurse”, and they need to hear from you. Our title of ‘nurse’ is in danger of being diluted. We must show that this is NOT OK with Ohio’s nurses. While we support Veterinary Technicians’ desire to enhance their training and skills, we do NOT support their adoption of the word nurse.